Originally called Hebridean Island Cruises (a name it changed in May 2006 to Hebridean International Cruises to reflect its wider-ranging scope of destinations, before changing it back again when it settled in the Western Isles), the company was founded in 1988 by a Yorkshire family who had previously operated a small canal boat company. Fanatical motor-boaters, they spent much of their free time exploring Scotland's lovely Western Isles, and got the idea of offering exclusive "millionaire's yacht"-style cruises while storm-bound one day in Loch Scresort, on the Isle of Rum. They bought the Oban-Mull ferry MV Columba from Scottish ferry operator Caledonian MacBrayne and had it totally refitted by George Prior Engineering of Great Yarmouth. It was re-launched (by Sarah Ferguson, the then-Duchess of York) as the Hebridean Princess -- with space for 46 passengers and 27 crew -- on May 26th 1989. After nearly ten years of successful operation, the business was taken over by Altnamara PLC in 1998. 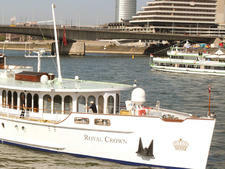 Its new managers decided to invest in a second ship and put it on far-flung international itineraries. In 2001, it acquired the 4,200 Megastar Capricorn from Star Cruises, refitted it (again at George Prior's yard) and launched it as the 80-passenger, 70-crew Hebridean Spirit on July 3rd, 2001. Citing the difficult economy, the line announced the sale of Hebridean Spirit in March 2009 and the ship departed the fleet in April 2009. Hebridean International Cruises and its sole ship, Hebridean Princess, were purchased by U.K.-based All Leisure Group, which operates both Swan Hellenic and Voyages of Discovery. The line also reverted back to its original name, Hebridean Island Cruises. Carrying just 50 passengers and designed to resemble a country house, Hebridean Princess is literally fit for a queen -- HM Queen Elizabeth II has sailed twice. Hebridean Princess has attracted a strong following among Britain's upper crust, who enjoy their exclusivity and the solid, unpretentious comfort epitomized by the "country house at sea" style. A world away from the pizzazz and scale of modern cruise ships, it offer cruises tailored to individuals who take an intelligent interest in the world around them. Passengers enjoy a quiet time onboard with good food and conversation, well-stocked (free) bars, and prefer attending lectures and watching the world go by to traditional cruise entertainment. Expect to meet well-heeled and largely well-educated Britons -- these cruises are popular with lawyers, doctors and company directors, as well as the odd aristocrat. Hebridean Princess' transformation from an inter-island ferry to an exclusive luxury cruise ship has been a gradual process. In its early days, the ship retained its car deck, allowing guests to board with their cars at a range of ports other than Oban. 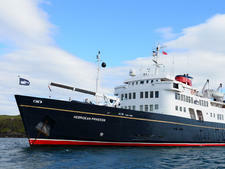 Hebridean Princess has gained a remarkable reputation as the cruise ship of choice for Britain's upper classes. In March 2010 the ship emerged from a major refurbishment with many of the public rooms being totally renovated. Also worth noting, the achievement of its creators has been crowned by the fact that Queen Elizabeth II chose to charter Hebridean Princess from her own private funds, in order to enjoy an 80th birthday cruise around the Scottish Islands in July 2006. She liked it so much, she chartered it again four years later. It now enjoys a Royal Charter -- the only ship which does -- proudly displayed with a huge crest in what was the smoking room, now the Lookout Lounge. The ship also participated in the flotilla along the Thames, organized in 2012 to mark the Queen's Golden Jubilee celebrations. Hebridean Princess confines itself primarily to Scotland, Ireland and Norway, and in some years it will also visit the U.K.'s Channel Islands.